Do you remember the days when lighting charcoal you would douse it with lighter fluid and create a small explosion when you dropped the match onto the pile? It's no wonder that your food had the taste and smell of lighter fluid. Yuk! Believe it or not, they still sell lighter fluid even today. But there is a much better way to light your charcoal. It may not be as fast as lighter fluid but it is safer, cheaper, and your food will taste great without the chemical odor or taste. It is called a charcoal chimney starter. I was turned onto the charcoal starter about a year ago and I was a bit skeptical as to whether they would work properly or not. But, after using one for the past year, I have never had an occurrence when it didn't work. The model I use is called Weber 7416 Rapidfire Chimney Starter. You can see how I use it to light the charcoal in my article which is about how to barbecue a whole chicken on a Weber grill. I’ve used the inferior models but they have rusted out on me and are basically flimsy in comparison to the Weber Chimney Starter. Just within the past few months I decided to invest in the best and started using the Weber Rapidfire Chimney Starter. Ever since the first time I used it, I knew this was the best charcoal chimney starter on the market, light years ahead of the inferior models I was using. If you are unfamiliar with how to use a chimney starter, it is really quite simple. I wrote a detailed pictorial article about it here. The first step is to roll up some newspaper and place it in the bottom of the charcoal chimney starter. Then you pour the amount of charcoal needed into the chimney charcoal starter and place it on your grill grate. Then using a match or a lighter (I like using those long matches that I use for my fireplace), you light the rolled up newspaper which is at the bottom of the Weber chimney starter. The paper will ignite and will eventually light the coals. From my experience it takes roughly 15-20 minutes before the flames are shooting out the top of the charcoal chimney starter. As soon as you see a white ash on the charcoal briquettes that are at the top of the chimney starter, the coals are ready for your grill. Grab the Rapidfire chimney starter from the handle and pour the charcoal into your grill or directly into your Weber charcoal briquette holders that are used for indirect grilling. What I usually do at this point is to arrange my charcoal depending on whether I want a single zone, two zone, or three zone fire. Then I cover it and let the grate get good and hot so I can get the grill marks on the food when I place them. It’s so easy to use a Weber Rapidfire chimney starter! I use mine with my Weber grills and my Brinkmann BBQ smoker and I love it. Another one of my favorite Weber grill accessories which I recently purchased is my Weber rib rack which is right up there with my Weber chimney starter. 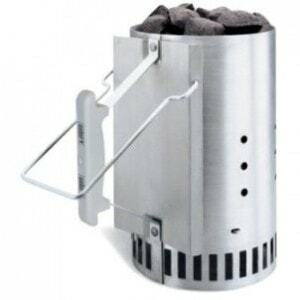 Chimney starter is built with rust preventing aluminized steel (great for outdoors). Equipped with safe thermoplastic handle. Cone bottom feature yields quick ignition separates it from the rest. Eliminates the need for lighter fluid. Will hold enough charcoal for a 22.5 inch kettle grill. If you care about buying quality, you should invest in a Weber Rapidfire Chimney Starter. You can start out with the cheaper models but you'll only be replacing them after a couple of months. If you're looking for the solution to how to light a charcoal grill, the Weber chimney charcoal starter is your best bet!